The Occupational Safety and Health Administration (OSHA) requires hearing protection whenever employees are at risk of being exposed to average noise levels of 85 decibels (dB) or more throughout an 8 hour workday. Worker complaints about sound, hearing loss, or difficulty carrying on normal conversations indicate the workplace may exceed that limit. To ensure the average noise level is safe for employees, measure it with a sound level meter. Some meters can calculate average noise levels throughout a period of time, such as an 8-hour workday. Others measure sound only at a given moment, so several readings need to be taken to determine the average exposure. Proper hearing protection is an essential part of any hearing conservation program. 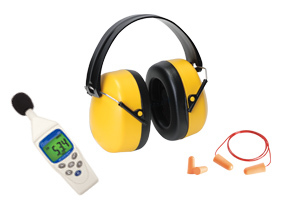 Appropriate protection can help reduce an employee’s noise exposure below 85 decibels. Employers can measure the effectiveness of hearing protection for the jobsite or facility by using the following formulas. These formulas assume a C-weighted sound level meter is used. Sound level meters are equipped with C, A, or both C and A decibel frequency weighting scales. The C scale represents how the ear perceives noise at high decibels and an A scale most closely resembles the human ear. When ear muffs or ear plugs, worn separately or in combination, will not reduce noise levels below 85 dB, engineering controls may also be needed. Controls can include limiting employee exposure, modifications to machinery, and adding enclosures or barriers to the source of the noise. Once the appropriate hearing protection is selected and fitted, train employees to understand the risks and how to properly use ear muffs and ear plugs. Ensure workers wear protection by regularly monitoring compliance and posting hearing protection signs in areas with hazardous noise.